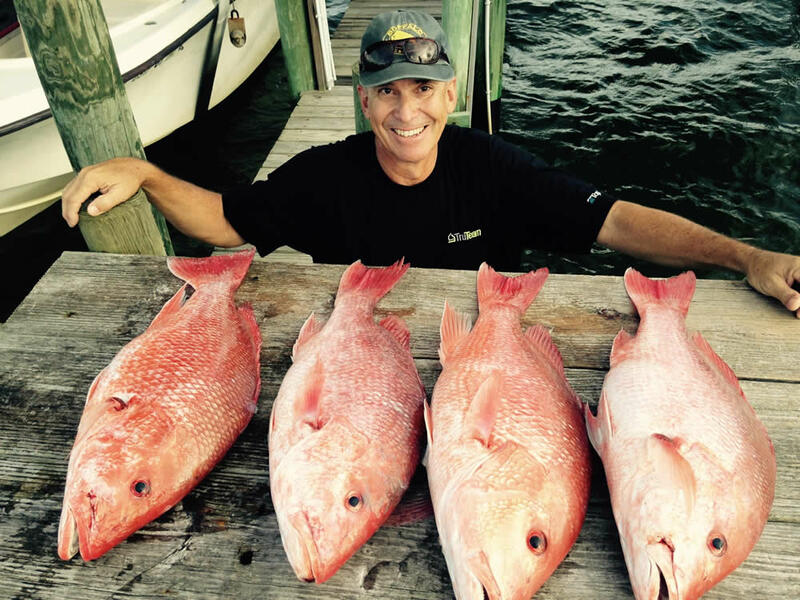 Summer 2016 pruduced lots of thrills for our clients. 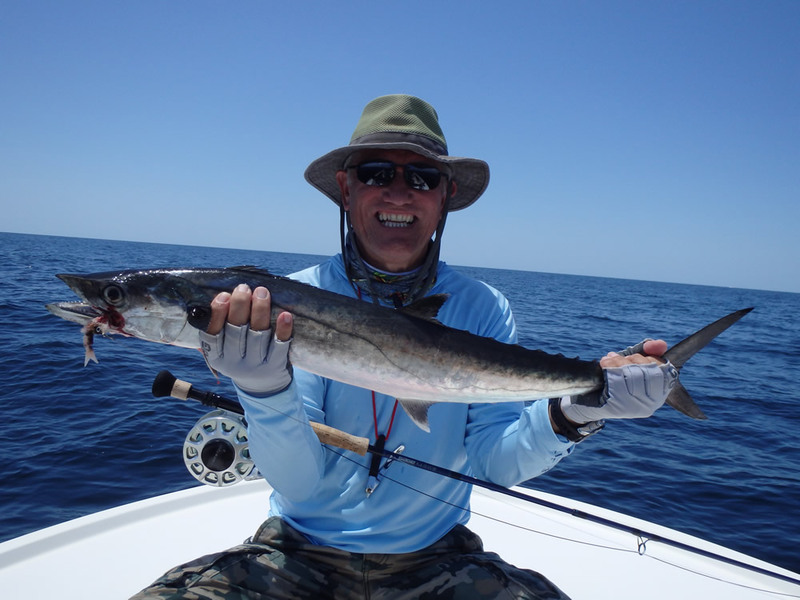 As we continued to shift our focus to fly-fishing the time previously spent bottom-fishing was spent chasing false albacore, amberjacks, ladyfish, redfish, Spanish and king mackerel, jack crevalle, and tarpon...all on fly. Here are photos from the summer season. Click on the thumbnails for full-screen photos. For photos from previous seasons click on the links to these additional galleries:Winter and Spring 2016 , Fall 2015, Summer 2015, Spring 2015, Winter 2015, Fall 2014, Summer 2014, Spring 2014, Winter 2014, :Fall 2013, Summer 2013, Spring 2013, Winter 2013, Fall 2012, Spring 2012, Winter 2012, Fall 2011, Summer 2011, Spring 2011, Winter 2011, Fall 2010, Summer 2010, Spring 2010, Winter 2010, Fall 2009,Summer 2009, Spring 2009, Winter 2009, Fall 2008, Summer 2008, Spring 2008, Winter 2008, Fall 2007, Summer 2007, Spring 2007, Winter 2007, Fall 2006, Summer 2006, Spring 2006, Winter 2006, Spring 2005, Summer 2005, Fall 2005. Use the back button on your browser to return to this page. 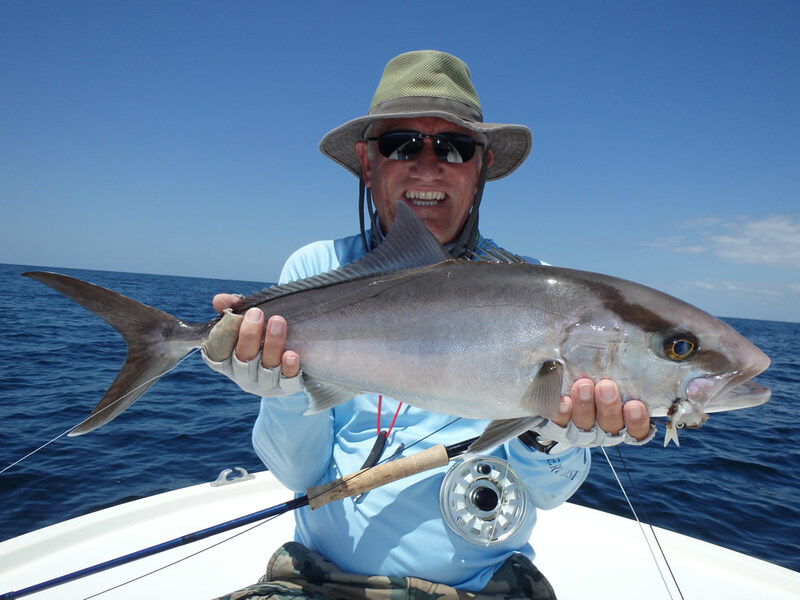 Mike Youkee kicked off the summer season on June 21 with this bad-to-the-bone amberjack on his 12wt. 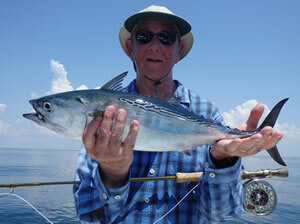 This fish took an articulated baitfish pattern designed by master fly tier Karl Elliott. You can't believe how hard the AJs fight until you hook into one. 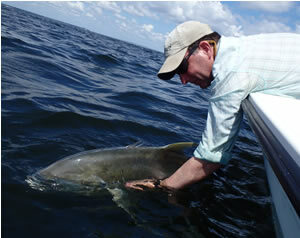 You have to stop the fish before it reaches the wreck 75' below, or you will very possibly lose your fly line. 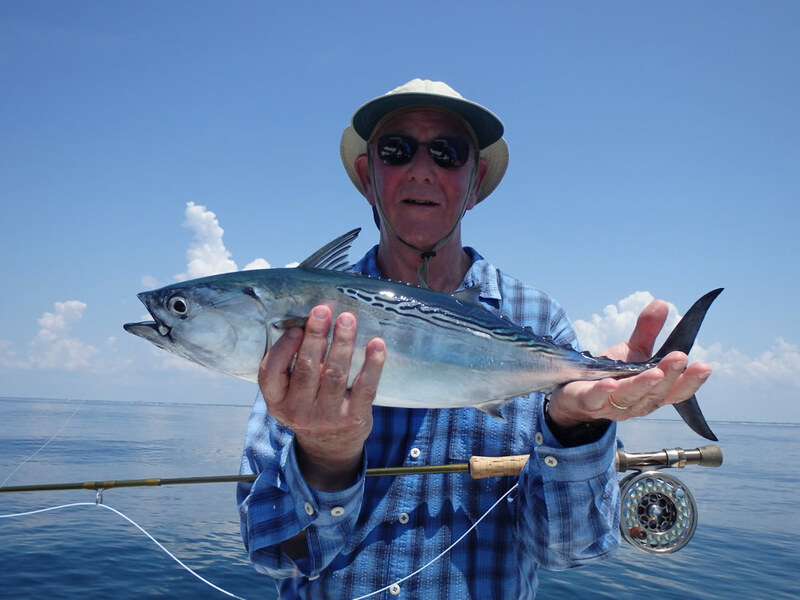 A little later this king mackerel slammed the same fly and was off to the races. 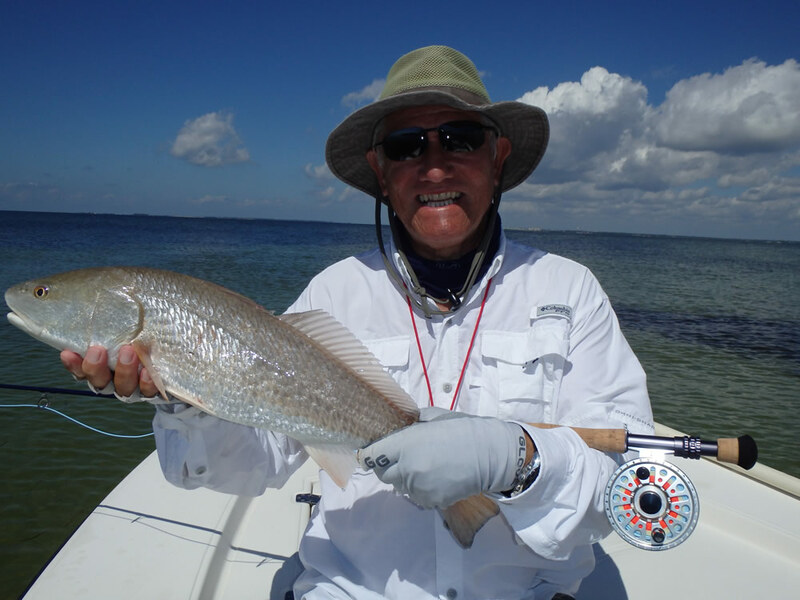 A couple days later on June 23 Mike coaxed this silvery-tan redfish to take an EP baitfish on one of our favorite flats in Santa Rosa Sound. 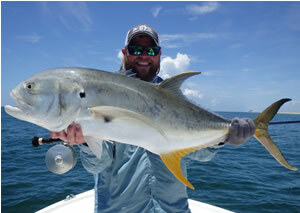 Kris Hemery only fishes for the "big ones", and on June 29 it was this jack crevalle that rang his bell. 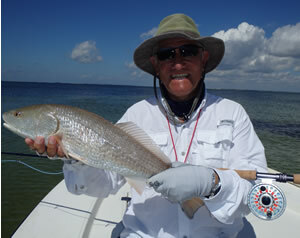 Kris was using spinning tackle and a large topwater plug. 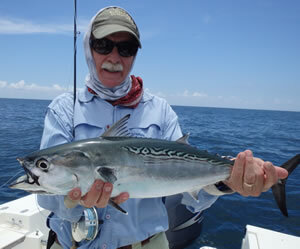 The false albacore arrived the first week of July to the delight of everyone who'd booked those days. 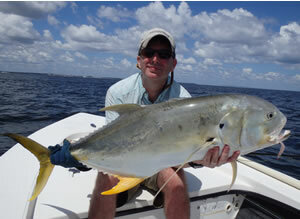 Here's Mike Broughton on July 1 with his first FA on fly. The fish took a #6 clear gummy minnow. Jay Lanier with a nice fat "football' on July 5. 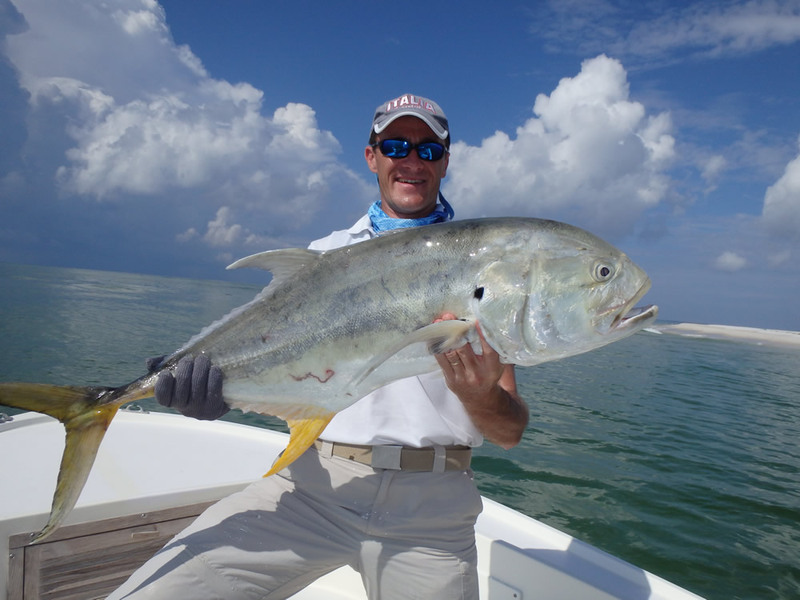 When the FA disappeared we ran over to the Caucas Shoal and found schools of jacks busting the surface. 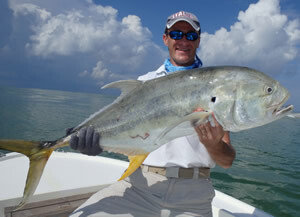 Jay put the big popper to work and this fish crushed it. The Walters Clan from Johnson City, TN, was in town for a couple days while the FA and jacks were active. 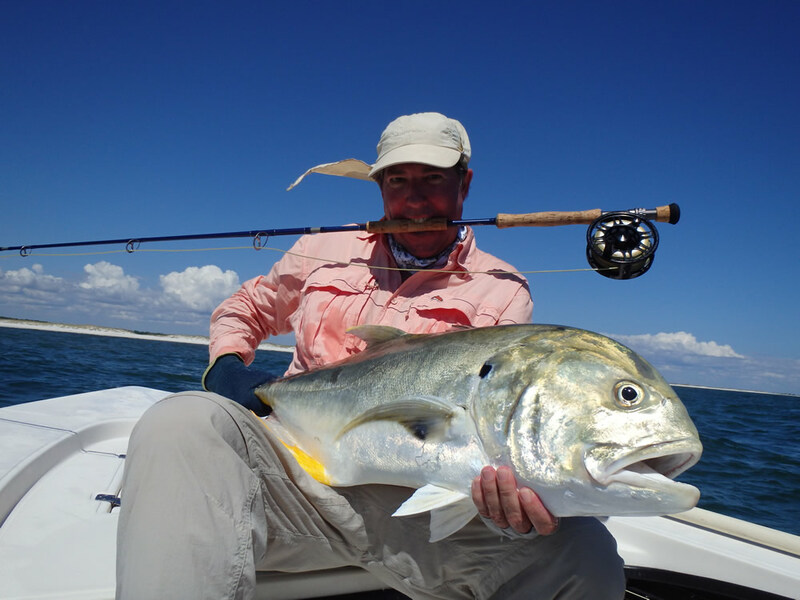 Here's Dave Walters on July 6 with a fine specimen on his 8wt Sage ONE. 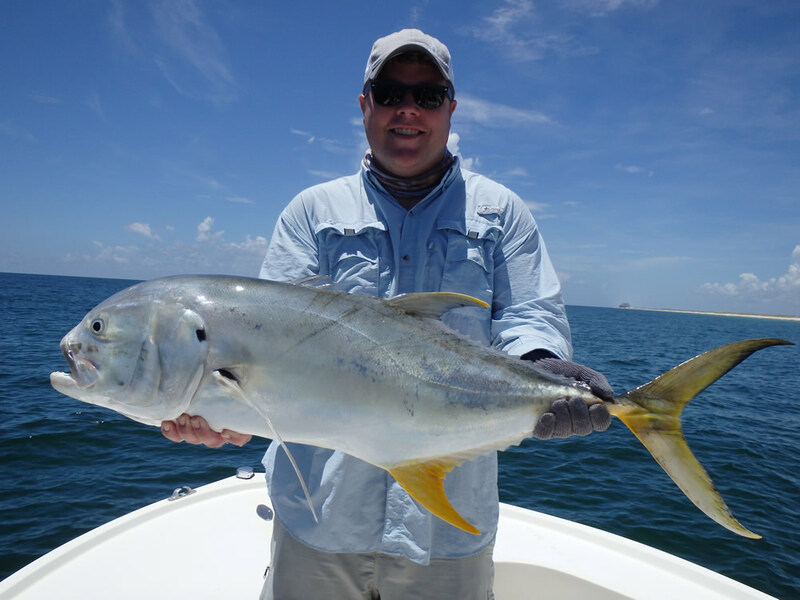 On July 7 we found a gigantic school of big jacks at the USS Massachesetts and caught them until we got tired of fighting them. What a problem! 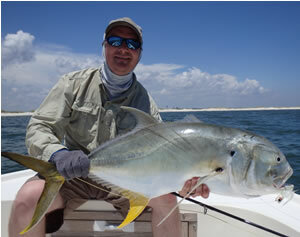 Ben Walters shown here with a 25# class jack on his 12wt and one of his beautiful custom poppers. 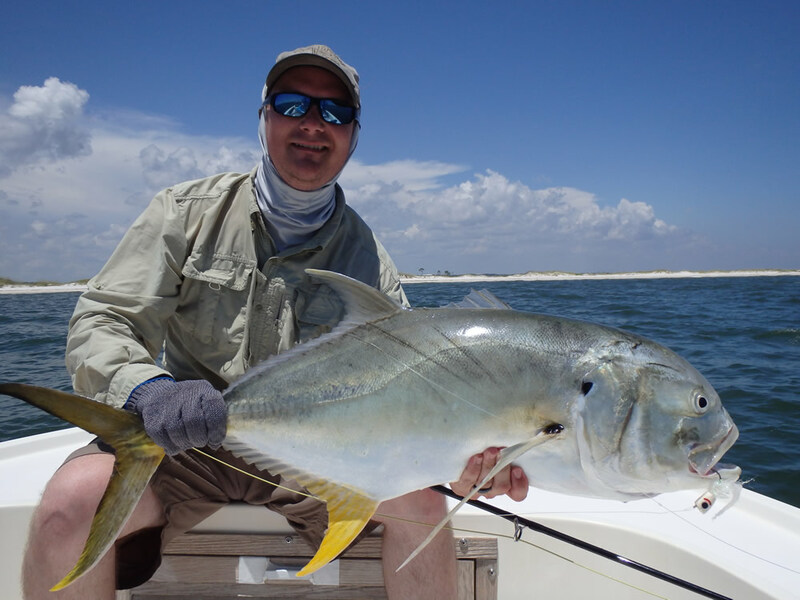 Brother Daniel Walters with another beauty landed on a topwater plug. 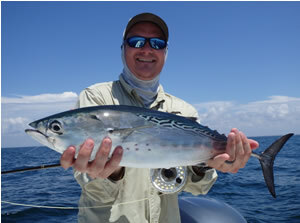 Houston's Malcolm Goodman on July 21 with a lovely false albacore on a glassy-calm July 21. 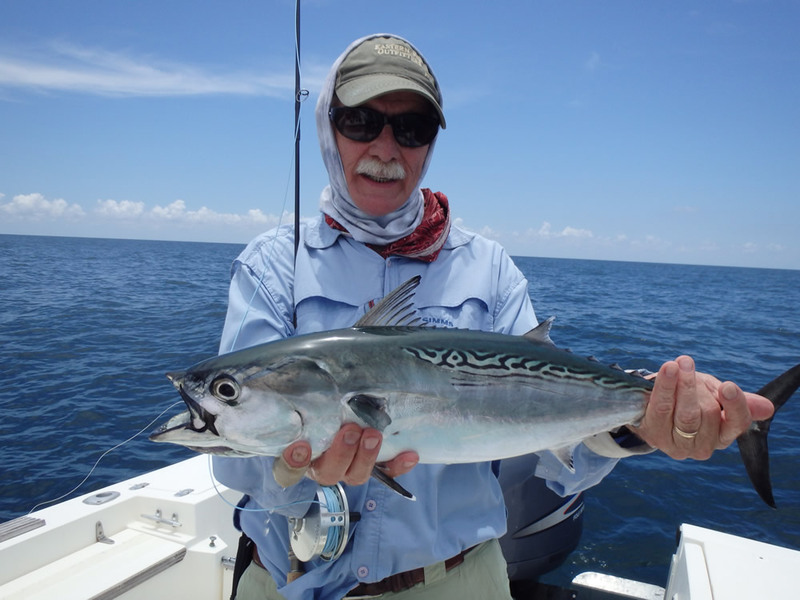 Stephen Miller from Chicago had a ball with the Spanish mackerel on August 15. 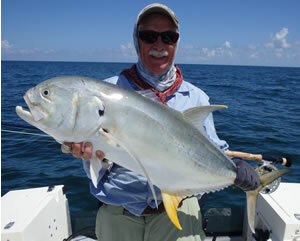 It's hard to beat the thrill of sight-fishing for big jack crevalle in shallow water. 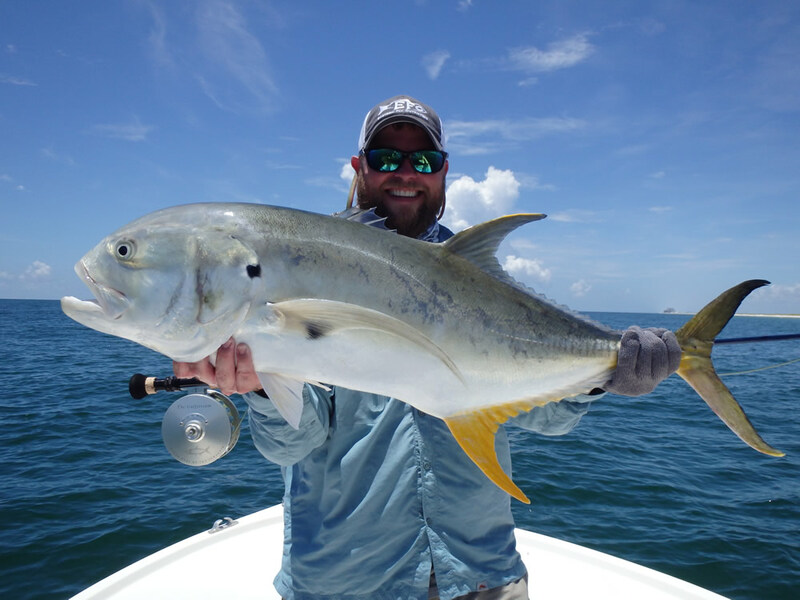 During the summer months the jacks are plentiful in Pensacola Bay, and we have a couple spots where we anchor and wait to ambush them using 12wt tackle and big poppers. 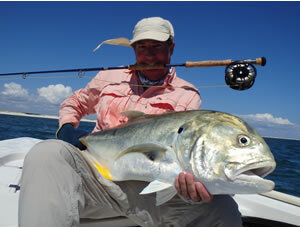 Here's a shot of a very happy Jeff Deuschle with his first jack on fly. 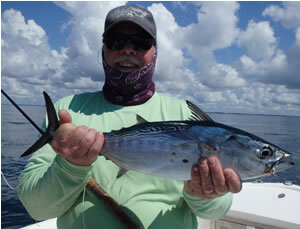 Jeff missed the hookset on an earlier take but brought it home the second time. Hearty congratulations! 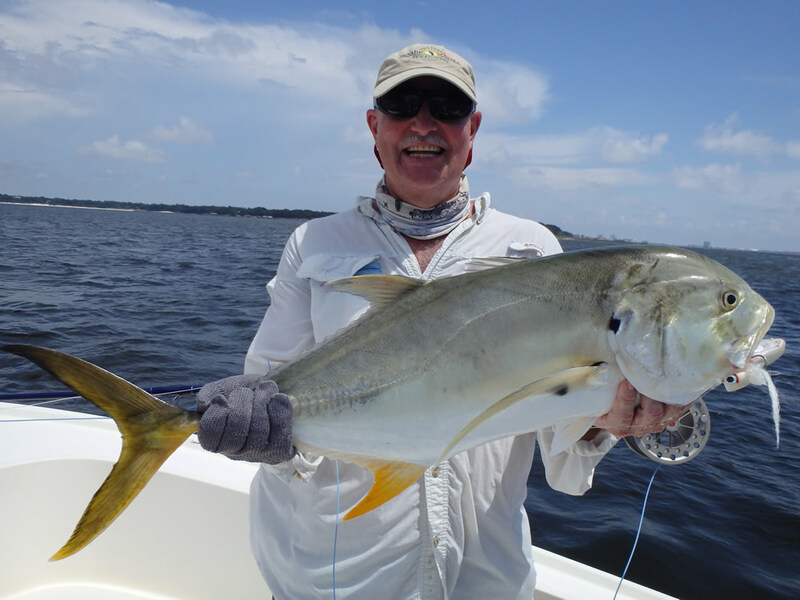 Peter Petruzzi on August 29 which turned out to be a "red letter" day of jack crevalle shallow-water sight-fishing in Pensacola Bay. 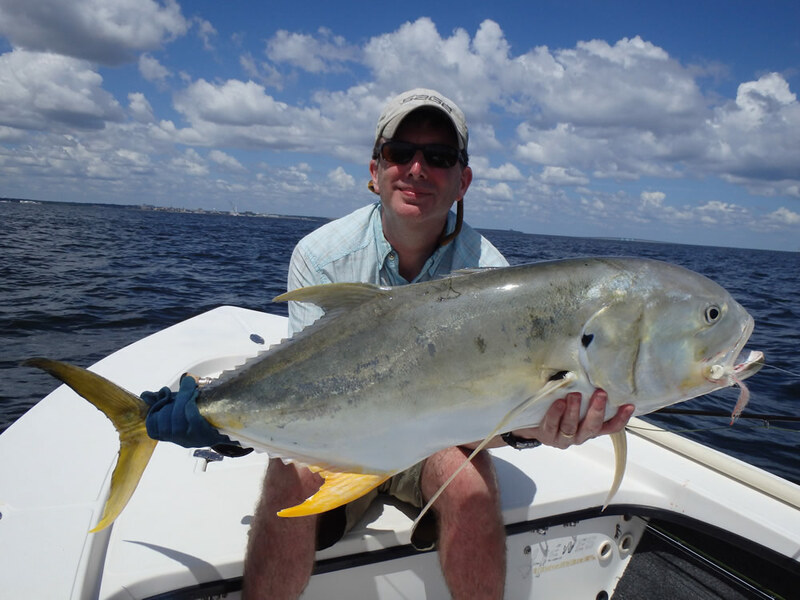 Peter hooked four jacks of this quality before landing this beauty in excess of 25 pounds. 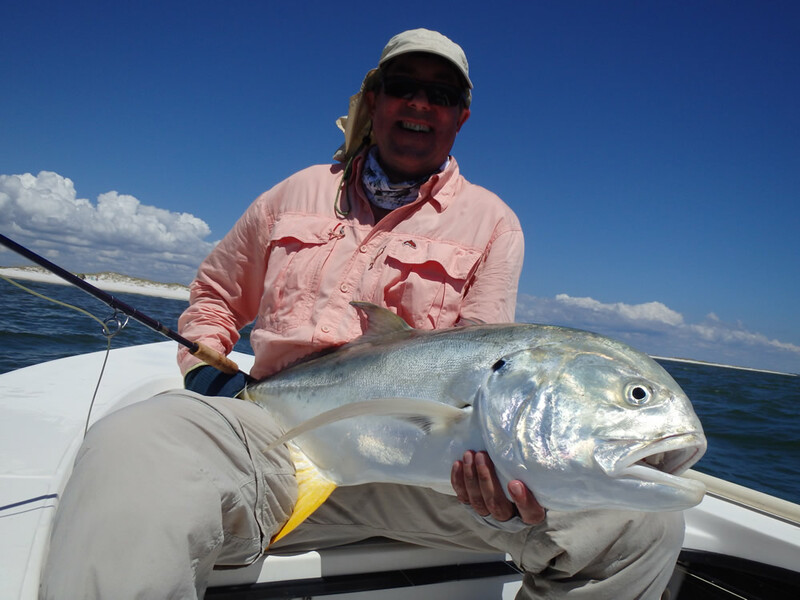 Mark Tischendorf is a trout fisherman from Bozeman who had never felt the rush of jack crevalle fly-fishing until September 15. 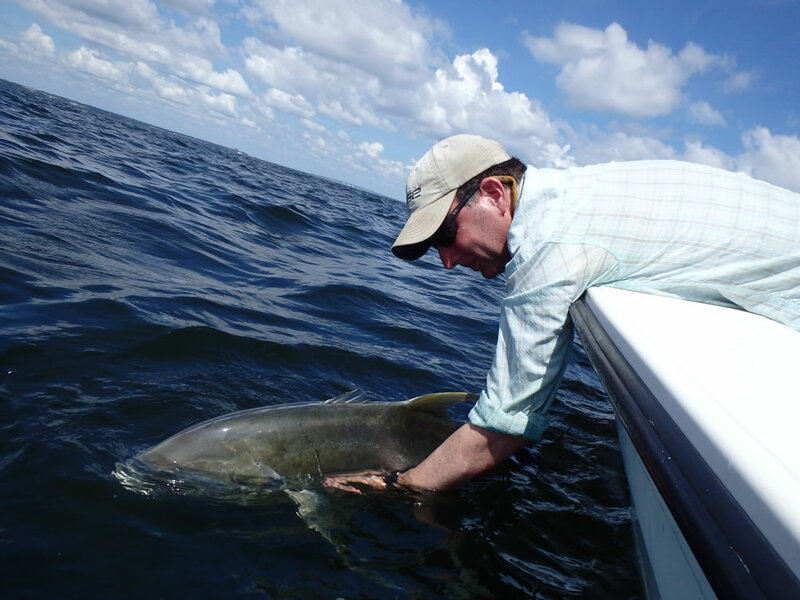 We ran out to the Gulf looking for false albacore, headed west across the Caucas Shoal, and encountered a tremendous "mud" the size of a city block. 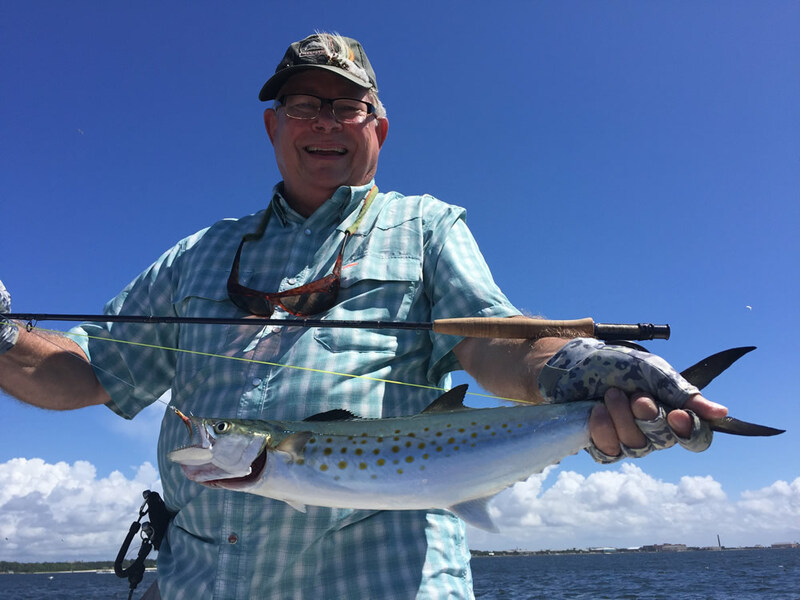 Of course something had to be creating the sub-surface disturbance, so we drifted through it with Mark blind-casting a big popper on a 12wt rod. 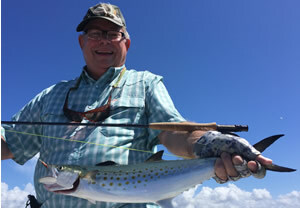 It was impressive how quickly he got the feel for double-hauling the 12wt considering he'd never thrown anything bigger than a 6wt. 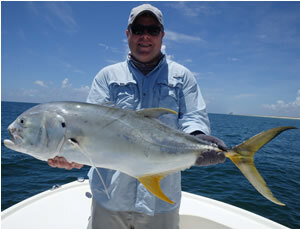 It wasn't long before we discovered the culprits...an enormous school of jack crevalle chasing mullet. 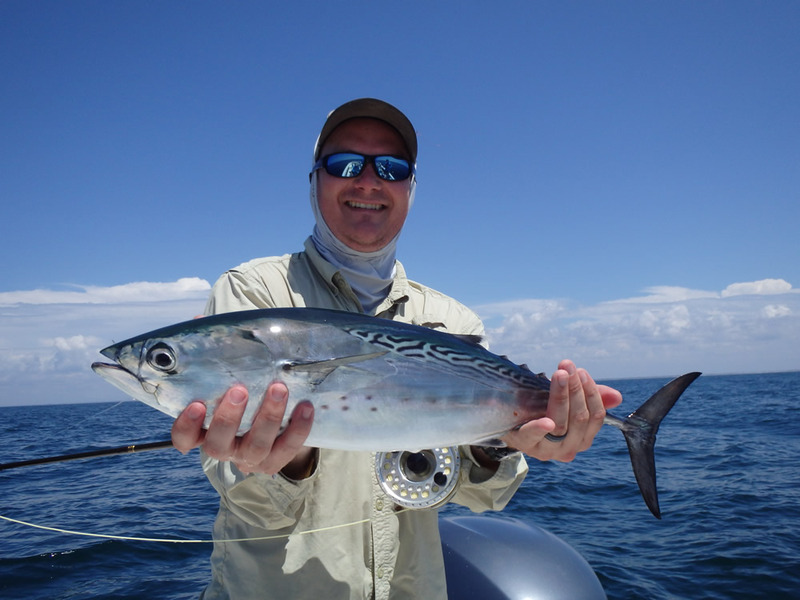 The fish were "high and happy" and tolerated our motoring to within casting range where I killed the motor. When Mark laid the popper into the school all hell broke loose. 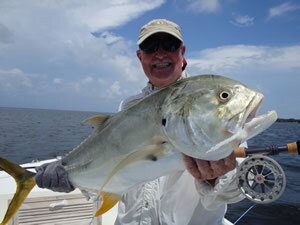 For the next four hours we drifted in the same general area with jacks all around the boat. 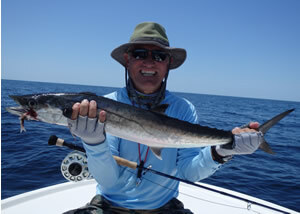 The photo above is of Mark's first fish and gives you an idea how aggressive the take was. 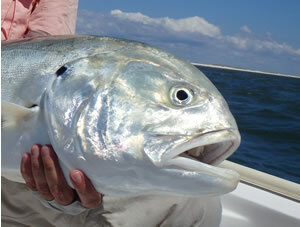 Check out the popper in the fish's throat. That popper is 6" long! Double-click for a full view of the fish. This shot is of Mark's second jack. 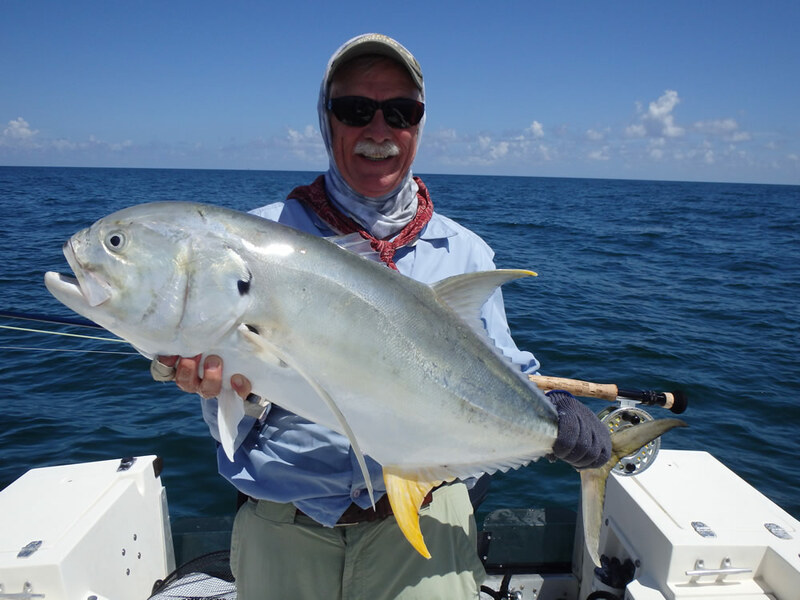 When the smoke settled he'd hooked and fought to varying degrees ten jack crevalle...landed four. When he finally got enough we sat there eating lunch with big jacks swimming all around us. We'll both remember that day for a long time. 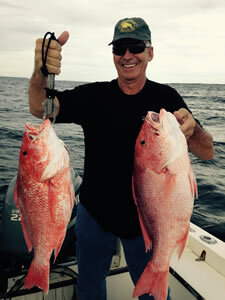 Wouldn't want to conclude the summer photo gallery without some red snapper photos! 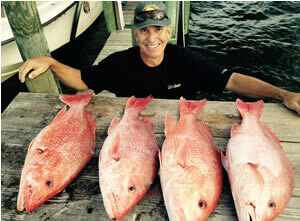 This is my brother Tim Yelverton on September 16 with a pair of "typical" Pensacola Bay snappers. 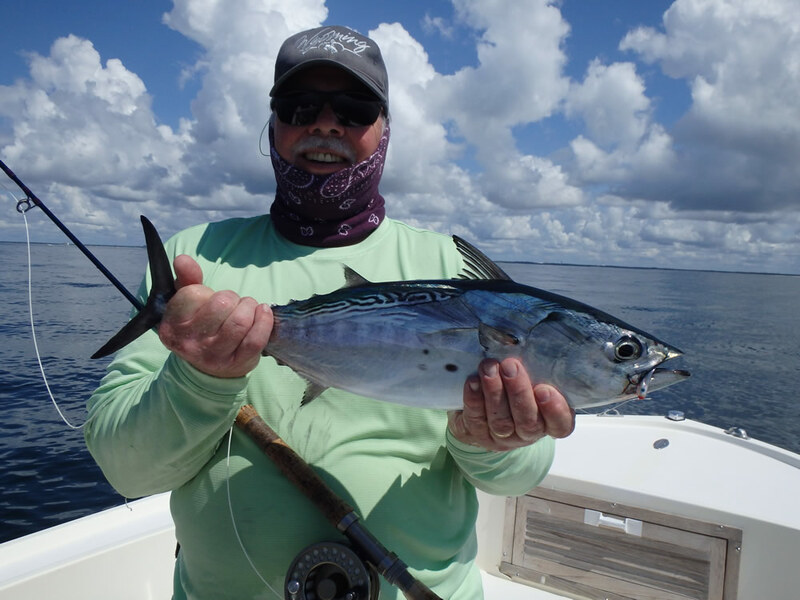 "Typical" if you're fishing in the right spot rigged with minimum 4/0 tackle, 60# line, 80# leader, the right bait, and an angler who knows how to hook and fight these incredibly powerful 8-20# fish over relatively shallow-water wrecks on 7/0 circle hooks. Nothing to it, right Timbo?